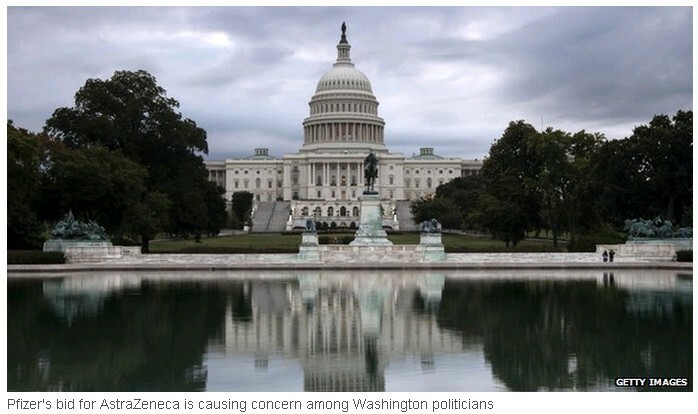 Pfizer's bid for AstraZeneca is being questioned by US politicians. The governors of the states of Maryland and Delaware have written to Pfizer's boss saying they are "very concerned" about the deal and the possibilities of job losses in their states. Meanwhile senators Carl Levin and Roy Wyden are looking to close the tax loophole that Pfizer plans to use. One of the attractions of the deal to Pfizer is that it could significantly lower the company's tax bill. In a strategy known as "tax inversion" Pfizer could pay the UK corporate tax rate of 20%, rather than the 35% rate applied in the US, if it bought AstraZeneca. In a statement Senator Carl Levin said: "I've long been concerned about inversions - companies moving offshore on paper, for tax purposes, while the management and operations remain in the United States. "It's become increasingly clear that a loophole in our tax laws allowing these inversions threatens to devastate federal tax receipts. "We have to close that loophole. I am talking to my colleagues about legislation to close the loophole, which I intend to introduce soon," the Senator added. Meanwhile governors Martin O'Malley and Jack Markell are concerned about job losses. AstraZeneca employs approximately 3,100 people in Maryland, and has around 2,600 staff in Delaware. The governors are concerned about reports that Pfizer has given assurances to the UK government that there will be no British job losses at AstraZeneca. They say they have had no similar assurances about AstraZeneca facilities in their states. "Our concern is exacerbated by Pfizer's history of closing US research facilities, including sites in Michigan and Illinois, after closing on previous corporate transactions," they said in a statement.